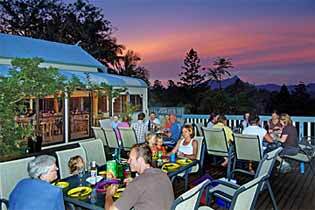 Bunkhouse and Dormitory style accommodation in the Byron Bay, Tweed Valley, Gold Coast Region of Australia. Whether you're backpacking though the Northern Rivers backcountry of New South Wales and Gold Coast countryside in Queensland, and like the company of fellow travellers, or you have a large group gathering like a family reunion, church, sporting, social club, special interest or school group, there's something here to suit. Generally these lodgings can accomodate 20 or more people. Direct access to the beach, and dormitory rooms with shared facilities available, with 2 swimming pools, a kiosk and a café, a barbecue area and laundry facilities. Free airport shuttle, bicycle and kayak hire. African drummers, fire dancers, Irish folk bands and circus spectaculars perform at holidays and festival weekends. Set on 2 hectares (5 acres) of subtropical forest, accommodation includes teepees, mixed dorms and private rooms. Guest facilities include outdoor swimming pool and hot tub, cinema, Buddha Gardens Day Spa, workshops, yoga classes, sunrise tours and more. Evening entertainment, food and drink at the Buddha Bar Restaurant and beer garden, or prepare meals in the communal kitchen. Centrally located on Byron's main street and just 8 minutes walk to Byron Main Beach, we have dormitory rooms with shared bathrooms, and self-contained apartment. Facilities include outdoor pool, a spa pool and laundry facilities. Free services include use of surfboards, body boards and bikes, free internet access, and free parking or pick-up from the central bus stop by arrangement. Backpackers Inn On The Beach is just an 11-minute walk to downtown Byron. A free shuttle bus and free bike hire are provided. Mixed dorm rooms, double, twin, triple rooms and female only dorm room available. Free WiFi, outdoor swimming pool and terrace with evening entertainment, kitchen and communal lounge. Just 200m to Main Beach, choose from private and dormitory rooms, with shared bathrooms. Large heated pool and BBQ area, cafe, dive centre and separate TV/reading room. Free use of bicycles and boogie boards, and pick-up from coach terminal by prior arrangement. 2 minutes walk from the beach with an outdoor pool and a fully equipped communal kitchen, Coolangatta YHA offers a free shuttle bus service to nearby locations. Facilities include secure private lockers, shared bathrooms, guest laundry, guest lounge and recreation area, 4 garden areas, and a large dining area with BBQ. Offering a 24/7 front desk, a tennis court and a restaurant, Christmas Creek Recreation Centre is 10 minutes drive from Border Ranges National Park in the Gold Coast hinterland. Accommodation available for 2-60 people in self-contained cottages and dormitory rooms, with access to a communal kitchen and shared bathroom facilities. Ideal for families and social groups away from distractions such as the TV, video games and cell phones. Located on the river and a short walk to Main Street with an array of dining options, choose from double or twin rooms or male and female bunk dorm rooms, all with a shared bathroom. Free WiFi, barbecue, and private parking available on site, or free shuttle service, especially for Mount Warning climb. Surrounded by valleys, mountains and native wildlife, we're just 15 minutes' walk from the village. Choice of private or dormitory rooms with fans, heaters and shared bathroom facilities. Secure lockers are provided in the dormitory rooms. Facilities include a shared lounge, kitchen and barbecue area. Free luggage storage, and free bus service twice a day to the shops, cafes and restaurants in Nimbin village. Still looking? Have you checked these out?